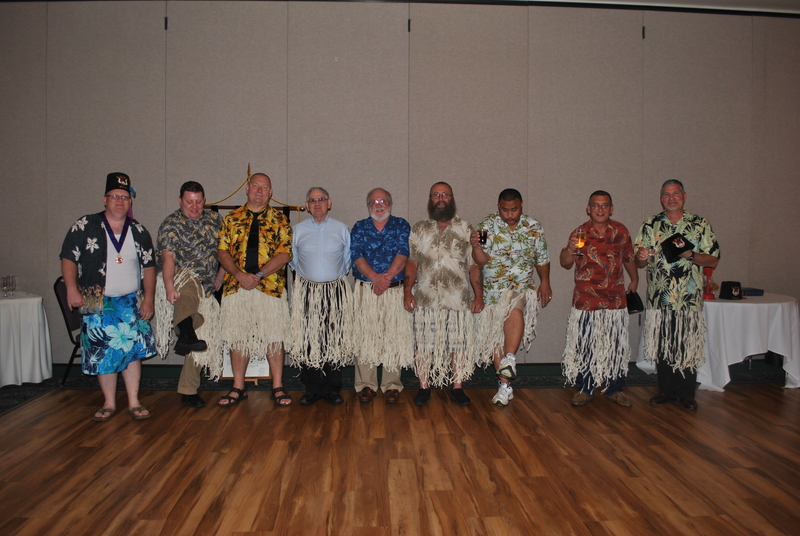 On Sunday, June 22, 2014, Ubar Grotto celebrated the summer season with a Hawaiian shirt night at the June stated meeting. Pro. Tim “the Tyrant” Settlemyer, wielding his massive stick of power, tried to wrangle the members, with little to no avail. With more than 35 Prophets in attendance, the occasion was festive and joyous as the final business was transacted before the summer season. Highlights included sponsorship of several charitible projects, including golf tournaments, ad books, and of course, more Enchanted Lanterns! The real highlight of the night, however, was the Ceremonial of the Order, wherein Ubar welcomed 8 new Prophets to the Realm. Being Hawaiian night, the new members were given extra special treatment, enjoying the grass skirts issued to them by the Monarch for the occasion. Pro. Brent Richards reprised his award winning role as His Majesty, while several other members of the Grotto took up their stations to help fill out the Ceremonial cast. It was a great night for the Grotto and one that will surely go down in the history books! Enjoy the summer break and we look forward to seeing everyone back in September!